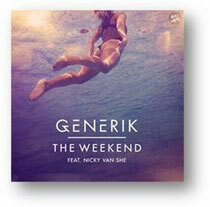 Released on Australian dance label, ONELOVE, ‘The Weekend’ is the debut single from new Australian house producer, Tyson O’Brien aka Generik, which features vocals from Nicky Van She, front man for electronic pop group, Van She. ‘The Weekend’ signals a pivotal point for Tyson. He is earning his dues, DJing at parties including the Bromance Tour alongside Brodinski and Gesaffelstein, Stereosonic Tour 2014, Big Day Out Boiler Room 2014, Coachella Villa After Parties, SXSW 2014, EMC closing party alongside Boys Noize and Cajmere, and the Alison Wonderland warehouse parties. Completing the package is the house mix from Belgian duo, Arches, plus a deeper, basshouse mix from Terace. It’s out 19 September, check it out below.